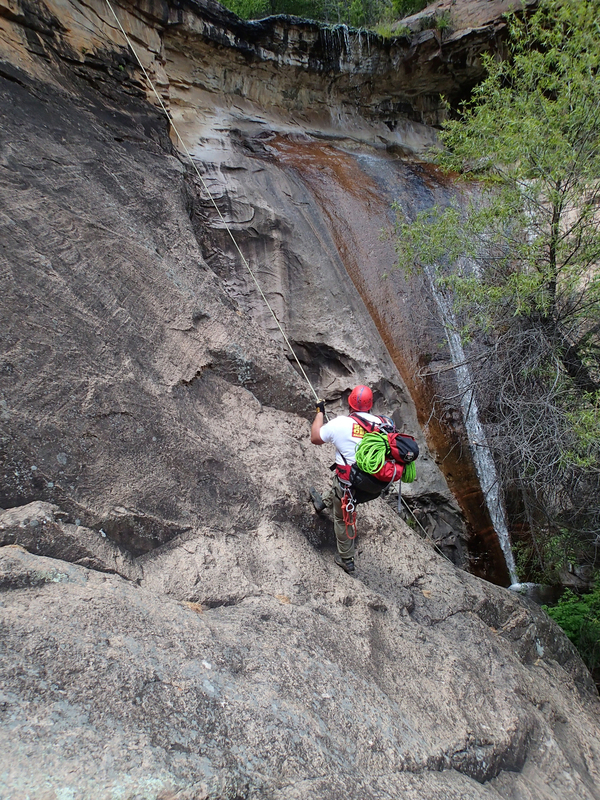 Pueblo Canyon, AZ - Technical canyoneering description, location, GPS route, photos, topographic map, and weather information. Pueblo canyon is a very remote trip out in the Sierra Anchas Wilderness where you are able to drop your gear and take a short side hike to explore some great ancient Salado Indian ruins along the way down canyon. It should be noted that the ruins of this area are irreplaceable and should be respected and left as they are found. Please bring a camera and take pictures as your memories so others can appreciate the history. 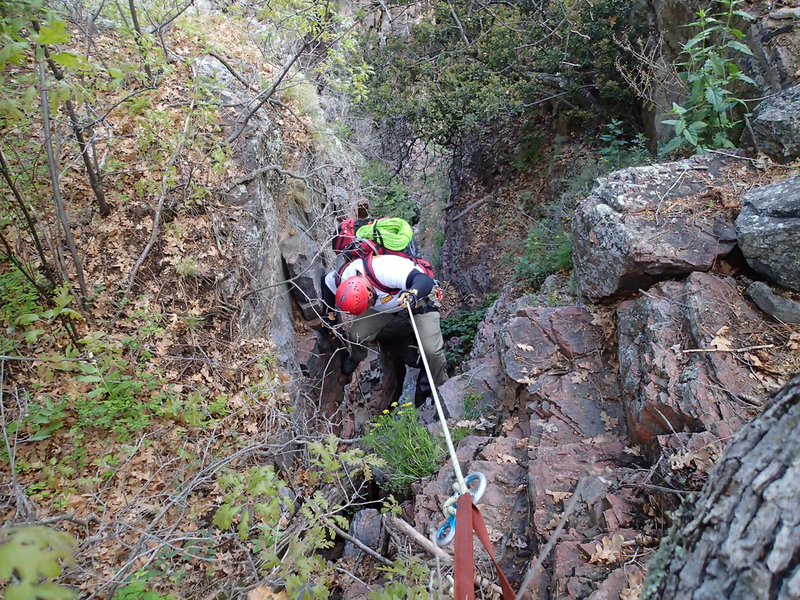 While running Pueblo, do not expect to see others in the canyon and realize that any rescue will be a long way off and extremely difficult if needed. A well known trail is often hiked into the bottom of the canyon from NF203/Cherry Creek Road that leads up to and behind a waterfall and eventually to the ruins themselves. 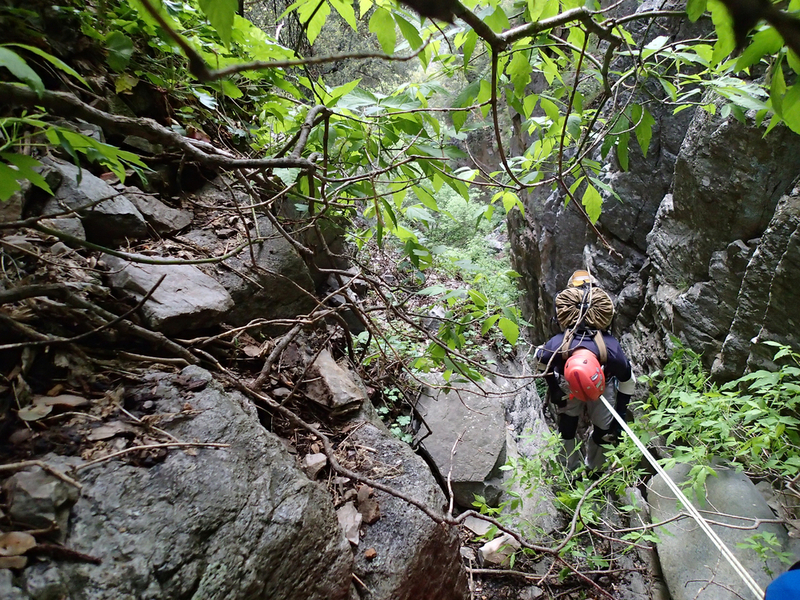 This trail is remote, overgrown is spots, and can be challenging. Due to this hiking trail, it seems reasonable that a technical descent of the canyon lends the opportunity to run Upper Pueblo, Lower Pueblo, or Full Pueblo. In total, we dropped enough hardware to complete 16 rappels though what would we would consider Full Pueblo. The trip is best completed with a shuttle driver as setting up a shuttle vehicle will require approximately 2.5 hours one way. As winter approaches, the Workman Creek road used for access is typically closed with snow or after December 15th. 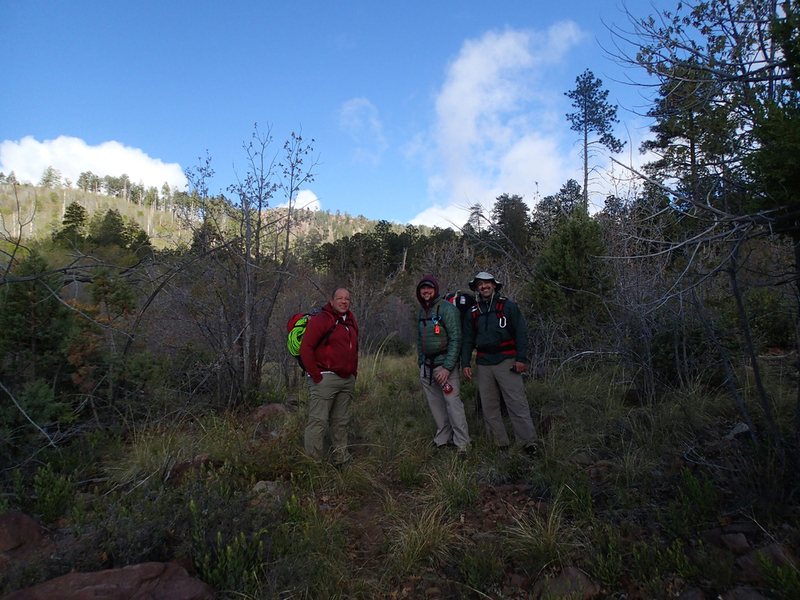 It may be advisable to check with the Pleasant Valley Tonto National Forest ranger station to make sure the road is open during the colder months. Our trip through Pueblo canyon began just beyond Aztec Peak. As you are making your way up, just before the road is gated at the Murphy Ranch you will find trail 141 that can be followed towards Edward Spring. 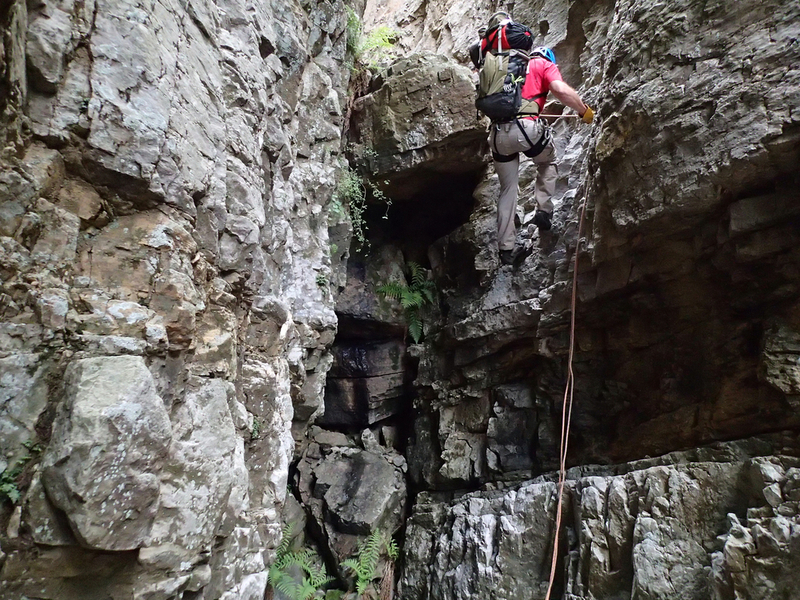 Once the spring is reached, the trail goes thin to non-existent but the canyon should be obvious and with some effort you will soon find yourself at the first rappel from a tree with a decent area to get geared up. 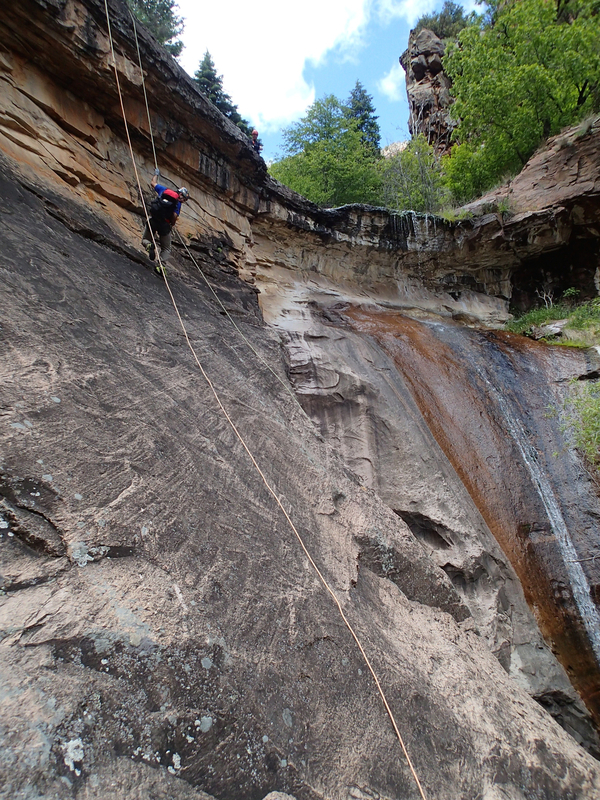 This entry is a side drainage that soon meets up with Pueblo and gear is needed to complete roughly 7 rappels of up to 130' - 160' (nearly all but the last two drops were under 60' and depending on your approach the final drop of the upper section can be negotiated safely with a 130' to the waterfall platform but 160' will ensure you can reach a pool below the ruins trail). 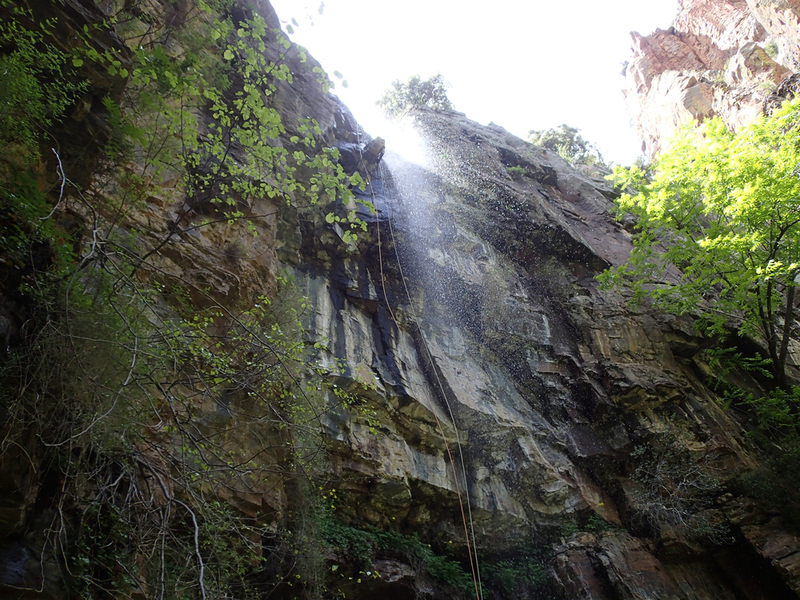 The last rappel of this upper section is directly down the waterfall that is along the hiking trail reached from Cherry Creek road. There is a nice landing platform in the watercourse that allows you to off rope a few steps away from the hiking trail or you could simply keep going another 30' (160' total rap), but is not really recommended unless you are planning to bypass the ruins and simply keep going on to Lower Pueblo. Once off rope at the waterfall, we dropped all our gear and followed the trail around on canyon left and were soon at the start of the Pueblo Indian Ruins. There are many structures here and if memory serves, there were three separate sections containing ruins along this immediate trail. Multi level ruins tucked into the walls with expansive fire areas built in are tucked into the cliff band with noticeable wall seeps where water could be gathered nearly 800 years ago. Once you have explored the ruins and made the way back to the waterfall and your gear, it is possible to either hike out along the trail or begin the descent of Lower Pueblo. 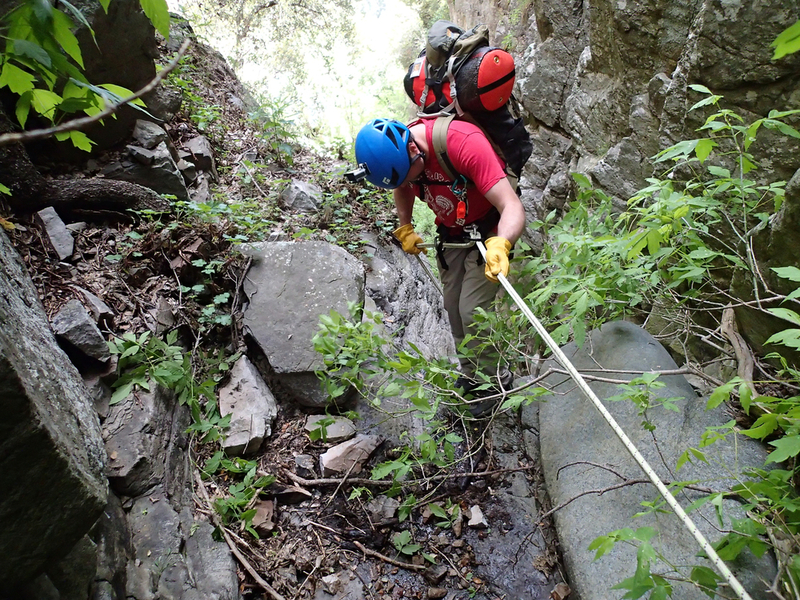 Lower Pueblo begins at the base of the trail waterfall where 9 rappels were encountered prior to reaching the vehicle. 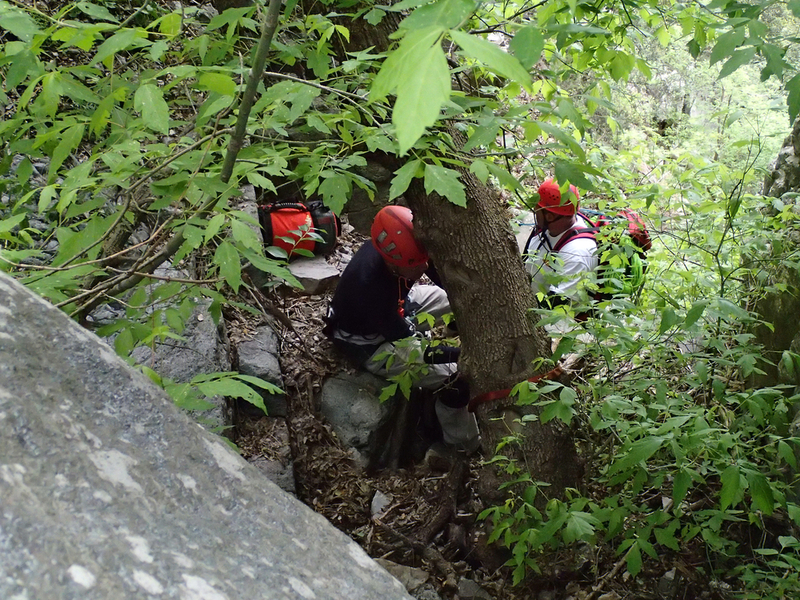 The longest of these drops requires about 60' of rope as the anchor was somewhat set back among the trees. Soon after starting the Lower section you will find yourself in what we referred to as the "Great Hallway". This was a long hallway like section that contained a handful of drops of various sizes nearly one after another until walls on both sides opened back up. Caution is recommended on at least one of the short raps who incidentally got the name of "Miss Piggy" as she ate our rope and required a short ascent to free it from her jaws. Once through the hallway several more drops are encountered and you may notice some springs begin to pick up the flow a bit. The vegetation in this lower section can get a bit thick in spots, but is also a good indicator that you are nearly completed. Soon you will reach the road and your shuttle vehicle and can begin to make your way back to civilization.